Could there be two words, God's word and man's word? Since it says, "the Word was God", let us cease distinguishing how man speaks and how God speaks. Rather, let us make efforts that whatever comes our our mouths are God's Word. The Word of God frees us. "The truth will set us free." Lies enslave us. 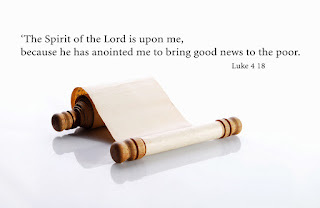 From the gospel, "The Lord has anointed me; he has sent me to bring the Good News to the Poor", God's Word frees us from the shackles of sin and helps us to live in freedom. That is our Good News in Jesus. The Word of God unites us. Love is the binding force of the Word of God. It unites us with Jesus and with his body. The Church, saturated in God's Word, is the body of Christ. Let our every action meant to unite our brothers and sisters in the bond of love, the love of the Trinity. The Word of God is incarnated in acts of compassion. In the first Reading, Ezra commanded the people to have a feast, but give a portion to the man who has nothing prepared ready." That is compassion. Like Jesus, the Word-made-flesh, let's incarnate in us the compassion of Christ. Then we would know how the Word enlivens us!